It’s time to review another monocular, and this time we’re looking at Roxant’s Grip Scope. This inexpensive model offers an excellent bargain, but is it worth it? Let’s take a look (pun definitely intended) and find out. The Roxant Grip Scope is 5.5 inches long, and weighs in at a mere 8.8 ounces. It features a 30mm objective lens, with retractable eyecups to offer adjustable eye relief for those who either wear or don’t wear eyeglasses. Roxant doesn’t specify the actual eye relief, but I put it at 12mm to 20mm, providing you with plenty of breathing room. The included accessories are basic and nothing to write home about. I prefer a wider neck strap than what’s included, but the one they give you is still functional. The carrying case is made from rather flimsy nylon, but it does include a belt loop. There’s also a hook and loop-closing flap for keeping your monocular safe and secure. No lens caps, unfortunately, so be careful of scratches. How Much Magnification Does the Monocular Provide? This isn’t a super-powerful monoc, offering just 6X magnification. With that said, the glass is so light you might not want much more than that, since there’s no tripod mount to keep the device steady and free of hand shake. Even so, I’ve used 8X and even 10X monoculars the same weight without too much trouble. What Type of Optics Does Roxant Use On the Grip Scope? For budget glass, Roxant didn’t skimp on the optics. You’ll enjoy a BaK–4 roof prism, with fully multicoated optics. This gives you an excellent image with plenty of detail, brightness, and contrast, and even good capabilities for low-light viewing. You’ll find the focus mechanism just downrange of the retractable eyecups, and it offers just enough friction to keep you from accidentally bumping your picture out of focus. 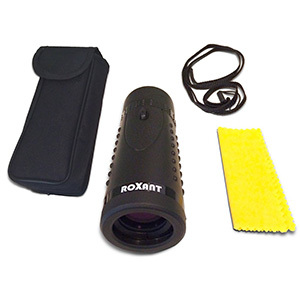 Roxant has built the Grip Scope with a clean, smooth focus wheel that allows you to easily get an excellent, crisp image of your subject, even when you’re using it with just one hand. 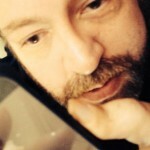 The image is clear and vivid, and there are no hints of any type of chromatic aberration that I could detect. This thing is nice and compact, and the comfort-molded grip makes it easy to keep a solid hold on it even while you’re focusing with one hand. The rubber exterior protects the glass against bumps and falls, just be careful with the lenses – no caps means you could easily scuff and scratch them up. The only downside to the body itself is the lack of a tripod mount. While you should be able to hold the glass steady enough to get a good view, it’s always nice to be able to go totally hands-free once in a while. The Roxant Grip Scope is both waterproof and fogproof, courtesy of O-ring seals and an optical chamber that’s been nitrogen purged. The rubber outer shell gives you plenty of impact resistance, so you don’t have to worry about the occasional bump or fall. The only concern you should keep at least in the back of your mind is scratching up the lenses. How Well Does the Roxant Grip Scope Work in the Field? Some reviewers have complained that this glass isn’t really good out to 100 yards. My experience is different, but I haven’t been trying to use it as a spotting scope at the rifle range (many of them have.) When it comes to birdwatching, eyeballing game in the bush, or watching your favorite sporting event, the Roxant Grip Scope is perfectly capable of providing you with excellent images. Just don’t expect to be able to use it to spot .22 long rifle shots from more than 50 yards. Thanks for checking out my review of the Roxant Grip Scope, a budget optic that’s still big on features and capabilities. The premium components used within the glass provide a fantastic image, but you will want to be careful with your lenses, since there aren’t any caps for them.